Who decides how you present you? In our effort to stand strong and straight, mentally and physically, we often project an ideal persona rather than a real person. A want-to-be persona that resembles a rooster showing its willingness to fight for dominance, prominence or survival takes over our posture. This outward display tenses our muscles, excites our nervous system and expects a response. We are taught, that this attention to posture will attract success. This is not necessarily the case. The problem with this persona posture is that it is not connected to what is really within its silhouette. In fact, this fake-it-till-you-make-it stance can lead you further and further away from what is true for you. I am not implying that you should depress your posture when you feel depressed. What I am suggesting, however, is to lift your posture’s alignment to meet that depression, or whatever problem is surfacing; rather than ignoring what is actually happening within you and jumping over it. Though jumping over obstacles may feel like triumphing over challenge initially, it is only bypassing the problem temporarily. The problem will resurface again and again! So what does it mean to stand strong? Is it an outward projection of what you want-to-be or an inward ownership of being you? I am going to borrow from the military because they have recognized the power of posture. Though, I also believe their breakdown can be developed upon to include civilian lives and a more entrepreneurial mindset. “At-Attention” military posture ensures strength through following another’s leadership. A soldier’s legs are together, thumbs pressed against the side seams of their trousers, fists closed. Their muscular system compresses their central line of energy, while their eyes focus past the scrutiny of their commanding officer. Abandoning one’s authentic nature, the soldier awaits orders for the protection of the greater whole. This abandonment of self could be compared to your mind-body stance when addressing your boss, a job interview, or a professional/social gathering. Anytime your posture is forced because you feel beneath the person(s), task or challenge before you, this is a physical experience of aligning. “At-Ease” military posture asks for strength through one’s self-discrimination. A soldier’s legs are spread, arms and fists relaxed but held behind their back. While the muscles of their limbs are at-ease, their torso remains attentive to what their rank tells them they should-be. A degree of authenticity is allowed here as eyes meet, and a relating to the truth of one’s experience or expertise is being sought after and discussed. This should-be attention could be compared to your mind-body stance when at your desk addressing work-tasks, organizing your home, or on a first date. Anytime your posture is stilted because you feel you should-be a certain way, you are trying to live up to the expectations put upon you by yourself or another. This is a mental experience of aligning. At-Peace–a life posture–upholds strength by allowing what is. Using the flow of energy to secure alignment, you become sensitive to misalignment. As the skeleton is prompted to align itself above and below one’s center of gravity, the muscular system becomes elongated and supple, giving the body’s central line of energy room to expand. This relaxed strength permits authenticity and personal reflection. One’s sense of self connects to their unique perspective, life purpose and self-development. Aligning oneself with personal beliefs ensues. This relaxed strength could be compared to your mind-body stance when on vacation, involved in a creative project or an entrepreneurial endeavor. You are at peace with who you are being. This is a spiritual experience of aligning. 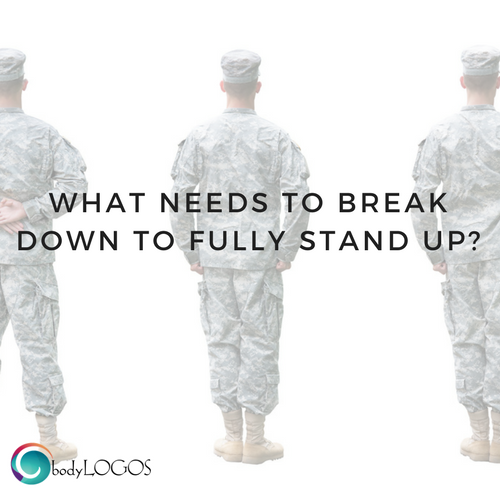 Military postures are what most of us relate to as good posture, because they are physically aligned. Their unyielding rigidity in body and mind, however, when used as a life posture, are exhausting and cannot withstand time without exhausting you. Replacing your energy’s rigidity with flow, renews your relationship with yourself, to be one that is at peace. We are all soldiers in life. Though abandoning one’s individual nature for the greater whole–to give one’s life–is viewed as upright and principled posture; I could say the same about a posture that is committed to one’s self. Breaking down the indoctrinated beliefs that it is selfish or unappreciative to believe in yourself, your differences, or your brilliance, is what truly escalates you fully into being! Self-awareness is found through a relationship with your body, mind and Spirit; and it is what makes conscious front-runners that can lead by example. To stand strong and straight is to know your beliefs, illuminate your resistance to living those beliefs, and restore alignment. Then you can be at peace with who you are being.